I set up camp today. 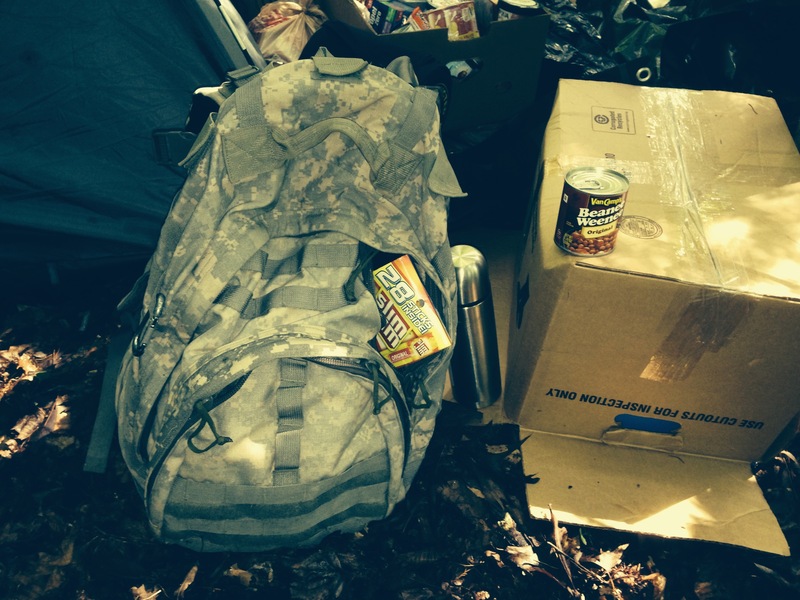 I got up, loaded up my tent and supplies, and headed out to start another 12 days on the streets. It’s been over a year since I came back from the streets last time, and I didn’t know if I would ever do it again… but over the past three months, I’ve been feeling God nudging me to spend some more time living without a roof over my head. I know some people don’t count this as really being homeless, and in some ways I agree with them. For instance, I know that on the night of October 30 I’ll go back to sleeping in my own bed next to my wife, I’ll be eating normal food again, and petting my dog, and remembering how cold I was while sleeping in my tent during my visit to the streets. And another way in which I agree with them is that, in some ways, I’m like a celebrity out here because I wear bright yellow shirts that ask the question “Do You Care?” on the front and “Prove It” on the back, and I’m very public about my thoughts and the things I experience out here—and that’s just the opposite of what I’d be doing if I were really homeless. So why in the world would I decide to “pretend” to be homeless again in the middle of October, when the temps are going to be in the lower 40s? Well, there are a few reasons, but honestly the most important is that I feel God told me to. I realize that to some of you, this doesn’t make sense, and to be honest it doesn’t make a whole bunch of sense to me, either. But it doesn’t have to. I just have to be obedient. This year, my goal is to ask you a simple question: Do you care that people are hungry in our community, that people are sleeping under bridges, in their cars, in tents in the woods..? 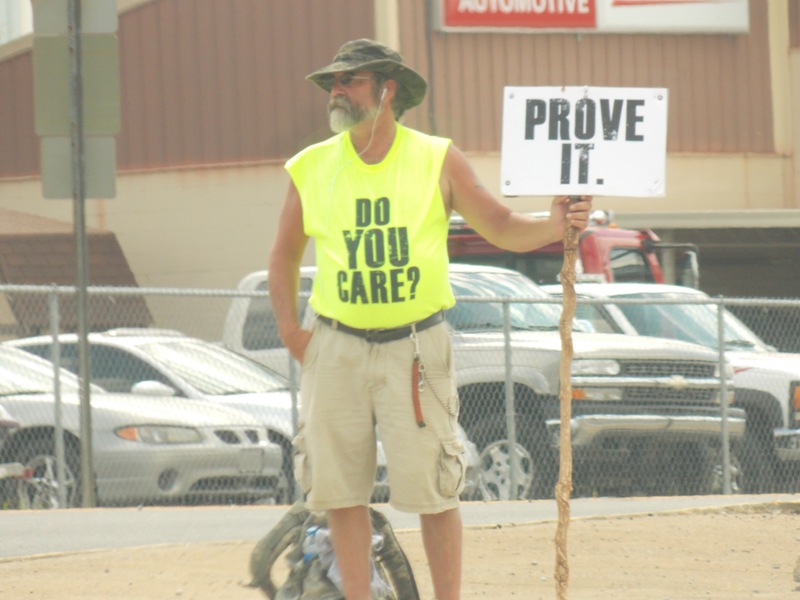 If you care, prove you care. By getting involved. Last year, I did a lot of standing on street corners, but this time it looks like I’ll be mostly walking ( a sort of prayer walk, if you will). I’ll be in different parts of Clarksville on different days, praying for our city and ways that we as a community of believers in Jesus can address poverty. (I’m asking those of you who will to pray with me over the next couple of weeks about this.) Honk if you see me… or stop and say hi. This entry was tagged homeless camp, Manna Cafe; Manna Cafe Ministries; Clarksville, Prove It, Prove It Clarksville, Prove It Movement, TN; Kenny York; homelessness;. Bookmark the permalink. Joining you in prayer my friend! Blessings to you for being obedient! Lifting you up in prayer and all the while remembering and praying for those who you are standing in the gap for! God bless you for you obedience! What can a community do? I used to go to churches where many single guys were renting separate apartments when they could have all been putting the cash towards a mortgage and equity and helping others. One pastor had empty rooms in his house while a member of his church steps in his van through the snowy winters. He told me he was under grace and what did I think. I asked from scripture “If you have things and see a brother in need and don’t share how cam the love of our creator be in you? He kicked me out and told at least one person I had a demon. The other co pastor was too busy writing sermons to drive a sick member to the doctor. Are you taking any homeless brethren in to your home?